"Disclaimer: I received a PureRun Minimalist Hydration Vest by Amphipod to review as part of being a BibRave Pro. Learn more about becoming a BibRave Pro (ambassador), and check out BibRave.com to review find and write race reviews!" It’s crazy that a hydration pack actually makes me feel safer on the run. I’m like a pack-rat runner, I like to carry everything with me and find stuff while I’m out. There was a joke amongst my girl-run-squad that my running spirit animal is a hamster because I ran all night once. This is why I pounced on the opportunity to test out the PureRun Minimalist Hydration Vest by Amphipod. 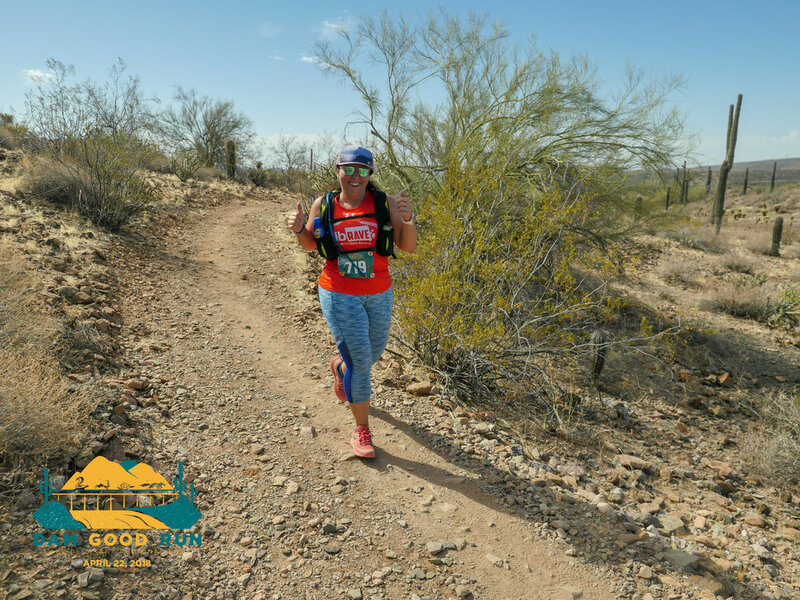 I had a 13k trail run coming up with Aravaipa Running and I knew this vest would be perfect for the race and for upcoming training. Also, ever since my ultra, I’ve just come to love to run with a hydration vest. My last vest was a no-name knock-off and I can tell you that I feel like a big girl now with my Amphipod. I love to take it all with me when I run: whistles, pepper spray, my phone, a knife, fuel, my iPod (yep, it’s 13 years-old! ), water, mini-tripod (for action photos), sunblock and my keys. I get that running with all that stuff can slow you down, especially on interval speed days. But the PureRun Minimalist Hydration Vest never let dragged down. I can carry it all without discomfort, the vest is light as can be. When empty the PureRun weighs 7.7oz. My heart did a happy dance when I saw all the storage pockets and space and then it did a flip when I realized the chest stash pockets expand! 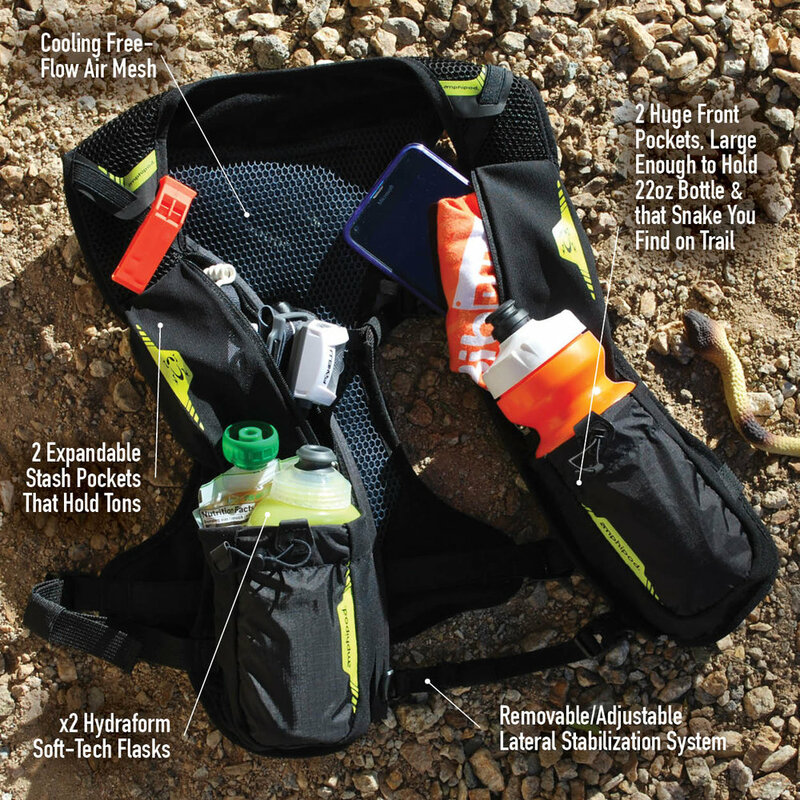 There is room for everything on this vest, you could even store a 2L hydration bladder in the back. The PureRun comes standard with two 12oz. bottles for hydration. Those are great, although I prefer drinking water from a hydration bladder. I did pack in a bladder from a previous purchase and it works great. Amphipod doesn’t tell bladders (yet), so I recommend finding one on eBay or Amazon. So, could a vest really be custom for everyone? PureRun most definitely is. The 360º CinchFit Stability straps helped me cinch the vest tightly around my waist to ensure no bouncing while I was running the 13k race at the Dam Good Run. The 3-Lateral Stabilization System straps are great but the 3rd strap was a bit awkward around my chest (lady-runner problems.) Thankfully the PureRun is so customizable that I was able to slip off the strap and run comfortably with only two. The vest comes in two sizes: Size 1 for a 24”-40” torso and Size 2 for a 36”-50” torso. I am a size 10-12 in women’s clothing with a 36 D bra size and I chose size 2 because of my bust. Extra gear on your body means extra sore spots and chaffing, right? Nope. Not with the PureRun. The vest is LIGHT. My 13k trail run took me a little over 2 hours to complete. That’s 2 hours in the full desert sun and the temps were approaching 90 degrees at the finish line. I was covered in salt at the end. But the minimalist design, custom fit for no bounce and free-flow Air Mesh cooling construction of the PureRun left me chafe-free! I didn’t sunburn either. I was able to pack a full-size of sunblock in the front storage pocket and I applied it 4x during the race! Watch-out vest competitors, Amphipod did a terrific job with their PureRun Minimalist Hydration Vest and people are going to turn to them now for their vest needs. Amphipod is a leader when it comes to waist hydration-belts and visibility (I’ve owned and run with the Xinglet Pocket in Hi-Viz for over 4 years) so it’s a no-brainer that they would lead with a hydration vest. If you would like to learn more about the PureRun and purchase one yourself ($100), please check out the Amphipod website — http://www.amphipod.com/products/hydration/purerun-vests/purerun-minimalist-24. Cross the Finish Line in a Baseball Field, With Friends! PR On The Rock 'n' Roll Arizona 10k Course!